Write the parties to the agreement: When you’re done with the property description which is the subject of your lease, provide your name and the name of the person or people you’re renting the property to. If this is part of a rental business or corporation, LLC or any other business organization, you have to state the business name instead of your own, for legal purposes. If you’re creating a form that you intend to use multiple times, you can leave a blank for the names and fill them in later depending on the circumstances. Outline the provisions: Take the time to write and come up with a list of key issues you want your agreement to address. This makes it easier for you to organize them under section headings if you’re neither customizing nor editing an apartment agreement template from the internet such as the ones we have attached in this article. If you think your section headings aren’t quite enough, you can add new ones for additional provisions. Detail responsibilities: Provide information for each tenant’s as well as the landlord’s responsibilities. This should be clearly defined and detailed especially when it comes to whom and when repairs are to be reported and who gets to pay for them, when these repairs should be made, lawn maintenance and building requirements for areas that has to follow code-specific inspections as well as garbage disposal. Leave space for signatures: Add space for signatures at the end of the article and have your tenant sign it after you, to make it legally binding and enforceable. It’s okay for you not to add additional witnesses and in most cases, you don’t have to sign your agreement in front of a notary. Now we provide this standardized Monthly Residential Tenancy Agreement template with text and formatting to help you finish your document faster. If time or quality is of the essence, this ready-made template can help you to save time and to focus on what really matters! 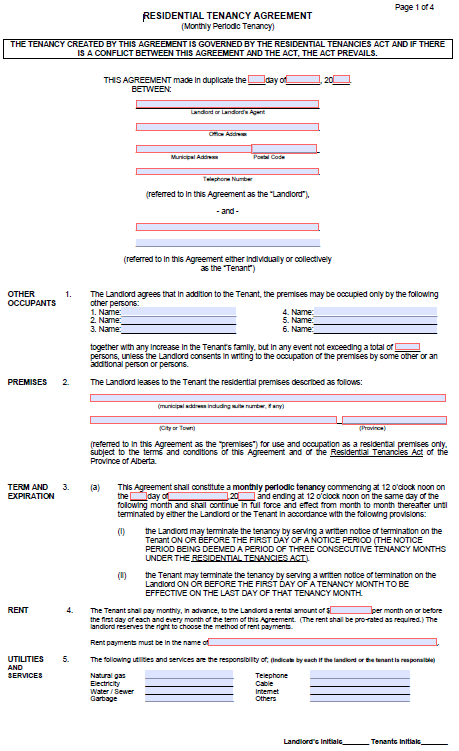 Download this Monthly Residential Tenancy Agreement template now! This template will perfectly suit your needs!